Firstly, it's a good idea to spend Chinese New Year at home so that when a stray fircracker whizzes off and into your pile of washing you can put it out before, you know, the whole buiding catches alight. 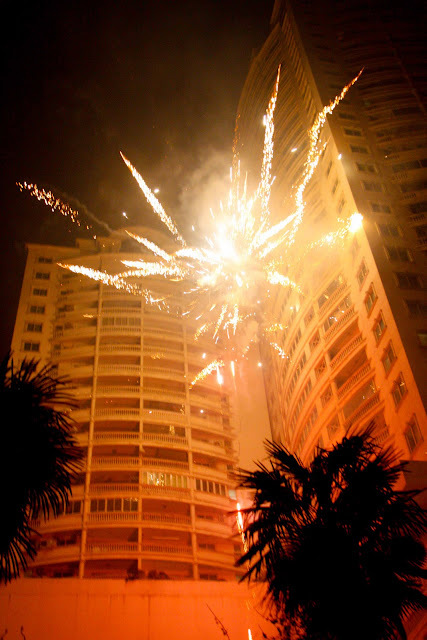 Now luckily it wasn't our house that caught fire, but an apartment in a friend's complex where we spent the evening lighting our own 14kg of firecrackers. Beijing had 160 building fires at Chinese New Year, Shanghai hasn't released their figures yet but you can bet it will be right up there given the number of old buildings and the tons of explosives going off in every doorway, alleyway, laneway and roadway in town. When it comes to letting off firecrackers it seems like the closer you can set them next to a building, the better. The security guards in the apartment complex had given tacit approval for fireworks by laying down a series of old doors on the ground for use as a sort of launch pad. Of course, everyone ignored these completely and set off their fireworks in the middle of the garden, which now looks like the site of a nuclear test. The crackers were exploding very close to the buildings surrounding us on three sides, but no-one seemed that bothered until I noticed a small fire on the balcony of one of the 10th floor apartments. I grabbed one of the guards and pointed it out to him, and for the next ten minutes he and the other guard walked up and down the garden, looking up, and apparently hoping it would burn itself out of its own accord, or the owners would miraculously come home at ten minutes before midnight. Suddenly the blaze was serious as the balcony glass doors exploded, shattering glass, and the fire took hold inside the apartment, belching thick black smoke. The ceiling was just caving in as the guards appeared, galvanised into action now. They were in the next-door apartment, throwing buckets of water around the wall dividing the two balconies, and doing bugger all to actually put the fire out. 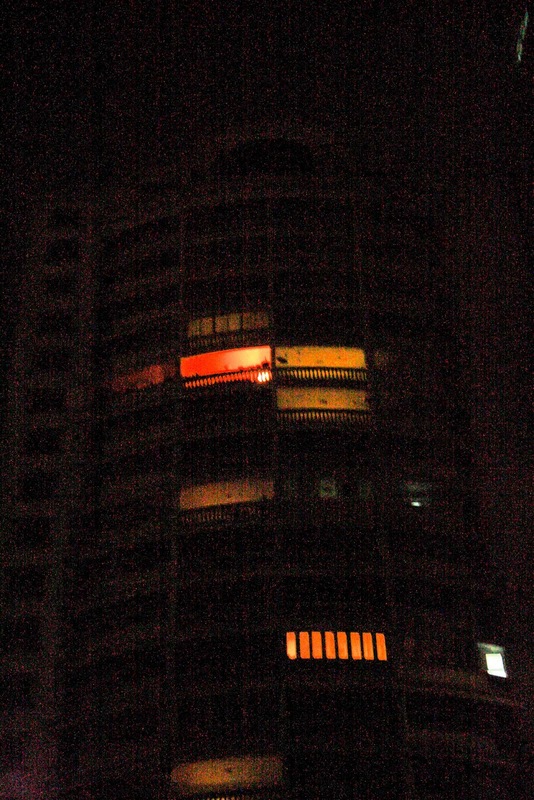 People on the upper floors had now noticed the blaze and were looking out of their wondows with increasing alarm. There seemed to be no evacuation taking place or any kind of alarm raised - this is China after all - there are no fire alarms, no smoke detectors and certainly no ceiling sprinklers. Just as I thought we would have to run in and start banging on doors to get people out someone busted down the apartment door with two big extinguishers and put the fire out. Thankfully no-one was hurt and no other damage was done but I felt so sorry for the family who would come home from their celebrations to find their apartment completely gutted. All the while the fireworks continued down below unabated. 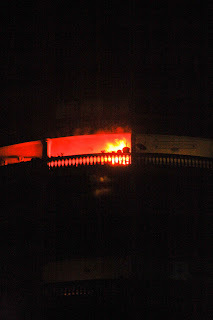 The fire was just a mere diversion from the real business of the night, making as much noise as possible. I filmed a short video to give you an idea of it all. The best fireworks come in big, big boxes, from carton-of-beer size containing about 50 fireworks, to refrigerator size, with over a hundred yun-hua (flower style) fireworks. The men drag the boxes into the centre of the warzone, pushing past dozens of other smaller fireworks exploding all around them....one stray spark and there goes your arm...What you do next is to light the fuse, with your cigarette, and run to a safe distance. Ten metres is considered safe by most Chinese. I stood and watched then, half-terrified, half-excited, as the coloured explosions whizzed all around me, next to me, overhead, underfoot, bang, whizz, bang, crackle, BANG, BANG, < BANG>< BANG>! and the shockwaves from each big firework hit me in the chest again and again and again. By now I'm partially deaf from all the explosions and it's like a warzone, total chaos, with sensory overload from the lights, the bangs, the smells, the gritty confetti in your eyes and up your nose. An hour later, the fireworks were still in major full swing, but it's 1am and we're heading home....as we left the buidling the fire service truck arrives, lights flashing, but they're way too late....guess it's their busiest night of the year. Happy Chinese New Year everyone! 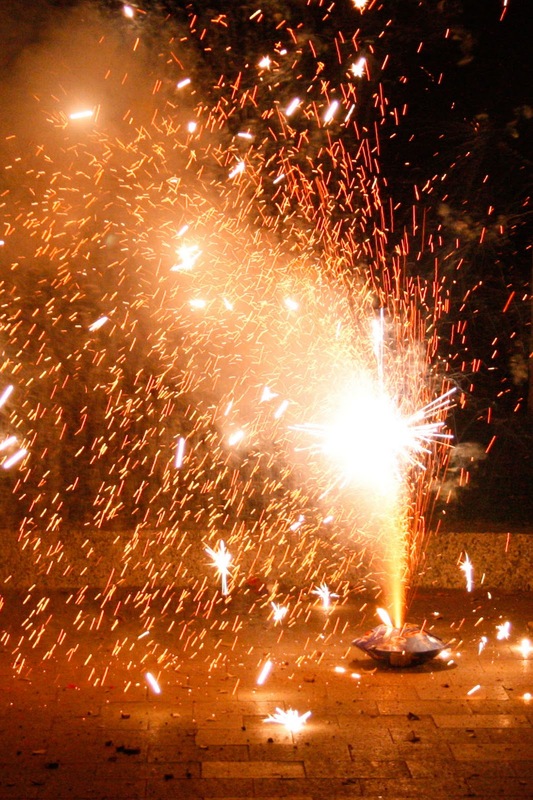 Hope your homes are free of housefires and stray firecrackers! Our Chinese New Year....a taste!